The Terrifying Tentacruel! Pokemon One a Day! After tackling a string of Pokemon I personally never cared for, we get to Tentacruel, a creature I've always though looked pretty unique and awesome! I came out swinging for this one, creating a very slick aesthetic in a representation that balances the Pokemon's original, extravagant design stacked against pseudo-realistic features of jellyfish. 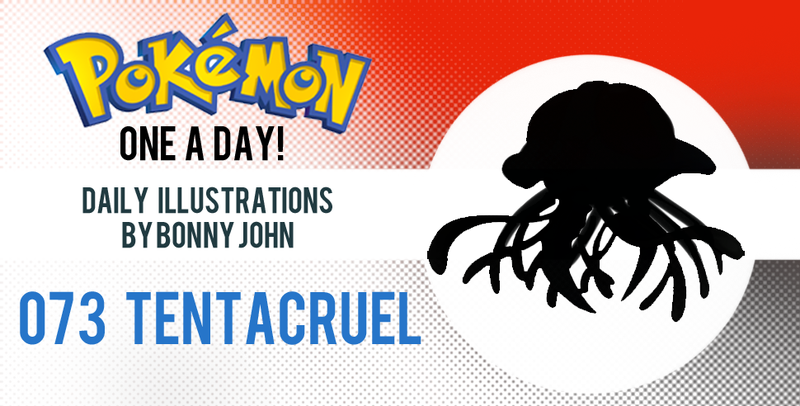 Tentacruel is a very interesting take on a jellyfish, as it is clearly based on one in the very loosest sense. It appears as a completely solid entity comparared to the squishy, mushy, and transparent real world counterparts. It appears to have a helmet, and a strange nose or beak like appendage that carries no real function, at least to my knowledge. The changes I created for today's illustration starts with the head piece, which has been made translucent and appears rubbery or slippery. If you notice that the shape is almost like a traditional UFO depiction , you wouldn't be mistaken in the nod! You see, I always saw the Tenta-Pokemon family to have alien-like features ever since I laid eyes on them. Tentacool has a very generic alien/Martian shaped head , and is also in possession of tentacles unlike a traditional jellyfish and more extraterrestrial with the ability to control minds on contact. All of this is very out there, but regardless, I continued that connection with Tentacruel. I Picture the Pokemon to be floating about the sea like a space ship cruising about. Even the polyps hanging from underneath its head is glowing in conjunction with the "helmet" as if it were a tractor beam touching ground! I had the polyps integrated into the design to give a nice balance to the tentacles, which I moved and have hanging from the inner rim of the helmet. Everything of the rendition is to call to the translucent body of the jellyfish, except keeping the only solid part of the body in the form of a head and the nose/beak connected to it. It is important to have some parts of the original shine through to give viewers a connection to what they're familiar with. The head and the new red eyes I gave Tentacruel are painted to appear under the helmet, to continue the illusion of translucence. I feel that the new eyes bring out the cruel of Tentacruel, and balances the bottom portion of the head with red from the top of the helmet. The bio luminescent effects seen in the dangling polyps and helmet also mimic some real world jellyfish and help showcases transparency, as well as continuing the trend of the otherworldly look it has going for it. And that's all there is to Tentacruel! I had a blast working on this one, and cannot wait to showcase the next family of Pokemon with you soon. As always, thanks for reading and viewing my work. See you tomorrow!